It’s never easy when a basketball team loses a player who averaged nearly 22 points per game, the top scoring total in all of Hudson County. But that’s what Dickinson High School boys’ basketball team had to endure this season, when standout 1,600-point scorer Tyrek Battle-Holley graduated and took his talents to McCook Community College in Nebraska. Battle-Holley was a two-time Hudson Reporter All-Area honoree, having earned First Team All-Area last season. He is clearly one of the best players in Dickinson’s rich and storied basketball history. Veteran head coach Sean Drennan realized that it wasn’t going to be easy to live life without Battle-Holley. The Rams own a 7-5 record as the 2018-19 season reaches the midway point. However, the Rams have a winning record for a reason. The point guard for the team is 5-foot-10 junior Jaylen Valentin, who has tried to develop into a point guard. Senior Jason Garcia is a 6-foot-1 guard who has been playing in the Dickinson program for four years and has been a starter for three years. Garcia is averaging close to 12 points per game this season. The shooting guard is 6-foot-2 senior Jacqual Gertrude, who is the son of former Dickinson and St. Peter’s College women’s standout Tonya Gertrude. One of the forwards is 6-foot-6 senior Beyon Wilson, who came to Dickinson from Great Futures High School. Wilson did not play basketball anywhere last season. Wilson had 18 points in a recent 47-46 win over Kearny. Wilson is averaging 13.1 points per contest. Another forward is 6-foot-2 junior Tymair Jones, who saw limited time with the Rams last season. Another forward is 6-foot-3 junior Kyelle Wilson, who has shown moments of brilliance this season. Wilson is the son of former Dickinson and Ramapo College standout Rashawn Wilson, a Hudson Reporter All-Area honoree in 2000. “He’s a lot more polished this year,” Drennan said of Wilson. Jonathan Hishe is a 5-foot-10 junior who transferred to Dickinson from Ferris. He has been a pleasant addition. The Rams just suffered a big loss when talented sophomore Luc Chapeau was lost for the season with hip surgery. The 6-foot Chapeau is the younger brother of McNair Academic standout cross country runner, county and state champion Claire Chapeau. 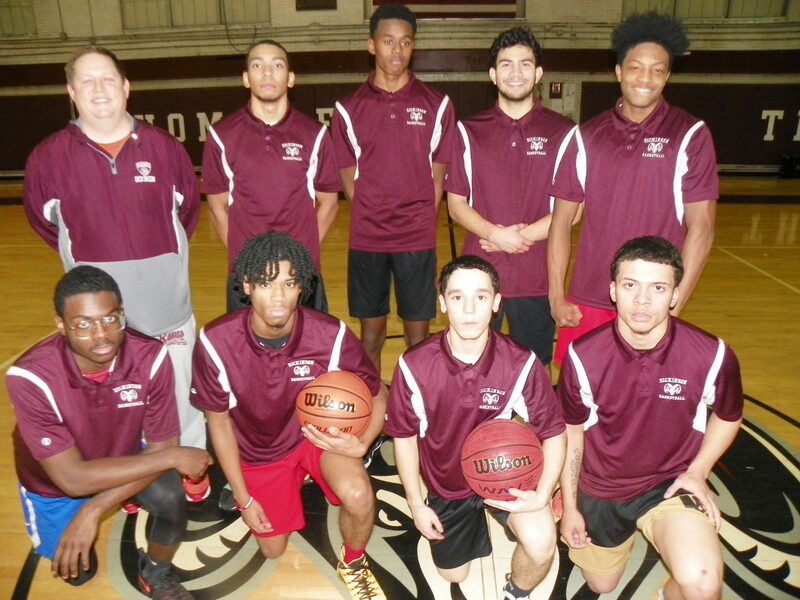 So the Rams are in the thick of things in the rough-and-tumble world of the Hudson County Interscholastic Athletic League and the upcoming Hudson County Tournament.